Uncovering Jamestown, Virginia ~ The History Girl! Over 400 years ago, on May 14, 1607, settlers with the Virginia Company landed on James Island, present-day Historic Jamestowne, Virginia. These first 104 settlers were set with the task of settling Virginia, finding gold, and discovering a water route to the Orient. However, they were almost immediately met by opposition from the Algonquian Native American tribe and quickly needed build a system of defense, shelter, and agriculture in order to survive and establish a successful colony at Jamestown. Through their written accounts, the first settlers described harsh living conditions, internal strife, suffering, and death. It would be almost 400 years later that modern-day historians, researchers, and archaeologists would rediscover Jamestown, dispel myths, and learn more about the structures, lifeways, and people that resided there through their garbage and material remains, located less than two feet below the surface. These discoveries have drastically changed the way we view and interpret Jamestown as the first permanent English colony in North America. From earliest times Jamestown was divided into two sub-areas. Old Towne is where Jamestown began as a settlement and where the original James Fort of 1607 has been rediscovered. To the east of Old Towne is New Towne where Jamestown grew into a city of manufacturing, businesses, homes, and the seat of government in the late seventeenth century. A military post was located on Jamestown Island during the American Revolution, and American and British prisoners were exchanged there. In 1861, the island was occupied by Confederate soldiers who built an earthen fort as part of the defense system to block the Union advance up the James River. Portions of the 1861 redoubt have been excavated for artifacts and remain today as part of the evolving landscape at Jamestown. After the Civil War, Jamestown Island was pastoral and agricultural. By 1893, a portion of the Jamestown property was owned by Mr. And Mrs. Edward Barney. That year, the Barney's gave Preservation Virginia, then known as the Association for the Preservation of Virginia Antiquities, 22.5 acres of Jamestown Island, including the 1690 church tower. In 1930, Colonial National Monument was established to include and connect Jamestown and Yorktown via a parkway marking the beginning and the end of the British colonial experience in America. In 1934, the National Park Service acquired the rest of Jamestown Island, totaling 1,500 acres. 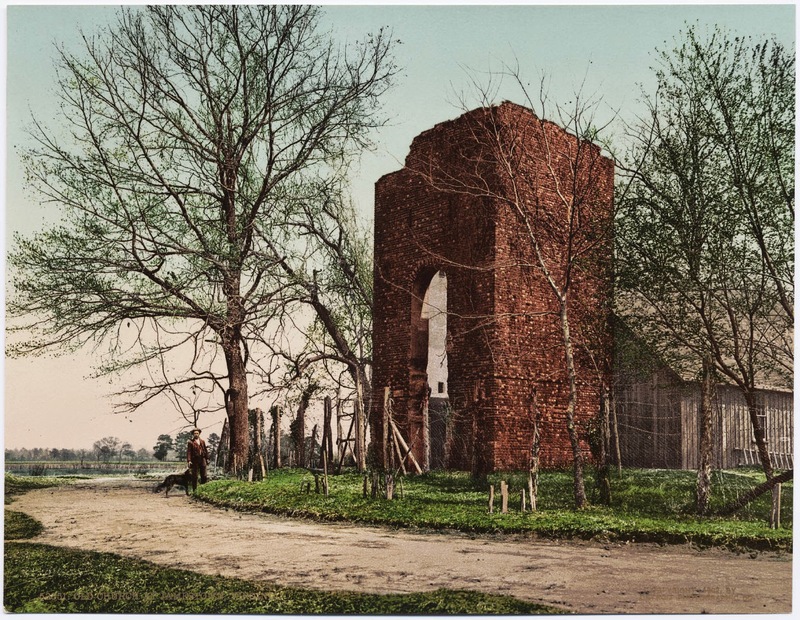 The ruins of the 1690 Church Tower at Jamestown, Virginia, circa 1902. Prior to 1994, most believed that the original James Fort site had eroded into the James River. However, one archaeologist, Dr. William Kelso, believed that might not be entirely true. It was that year that Dr. Kelso began what has turned into twenty years worth of continued archaeology, well over two million artifacts, and remarkable discoveries that have changed the way historians interpret Jamestown, its early years, and the relationships between Native Americans and the English. In 2007, the 400th anniversary of the founding of Jamestown, an Archaearium, visitor center, and a research center were established. The Archaearium contains exhibits that focus on the Virginia Company period and reveal a new understanding of the first English settlers, their relationship with the Virginia Indians, their endeavors and struggles, and how they lived, died and shaped a new society. It contains artifacts found at the fort and includes displays of arms and armor, medical instruments, personal objects, ceramics, tools, coins, trade items, musical instruments, games, amusements and food remains. Sketch of James Fort sent to King Philip III of Spain by his ambassador Zuniga. The sketch was found on the back of a map made by John Smith in 1608. The cross is thought to represent the church and the flag may be a garden. Archaeological work has uncovered a kitchen cellar at Historic Jamestowne, Virginia. Two brick bake ovens, a staircase carved into the clay, and thousands of artifacts have been uncovered at this site as of July 2014. Evidence suggests that this cellar may have served as the fort’s common kitchen. As the kitchen fell into disuse, colonists filled it with clay and discarded objects including suits of body armor, a face guard from a helmet known as a close helmet, and over two dozen sword parts. During excavations of the kitchen cellar on July 27, 2012, archaeologists uncovered a row of what looked like human teeth. The teeth were buried in a layer of butchered animal bones and artifacts dating to the dark days of 1609 - 1610 known as "the starving time." During that time, there was mass starvation for the settlement's 300 inhabitants. George Percy wrote in 1625, "Notheinge was Spared to mainteyne Lyfe...as to digge upp deade corpses outt of graves and to eate them." These words that Percy wrote were not fictional, like many had thought. The skull belonged to a fourteen year old girl, now named Jane by the archaeological team. She was buried in the trash pit along with the remains of horses and dogs, which were also sources of food during this desperate time. Researchers believe that Jane arrived at Jamestown in August 1609, but it is unlikely that she was of the upper class, so her true identity will most likely remain a mystery. There were five churches at Jamestown between 1607 and 1686. The first church services at Jamestown was held outdoors under a sail fastened between three or four trees. Shortly thereafter, a more permanent structure was built by the colonists, similar to a barn, "covered with rafts, sedge, and earth." The church building burned in 1608 and was replaced by a second, more substantial structure. In 1614, the daughter of Chief Powhatan, Pocahontas, and John Rolfe wed in spring 1614, ushering in eight years of peace between the colonists and the Powhatan Indians. In August 2010, archaeologists began to uncover the footprint of a building, which they believed was the church. It was not until they discovered four graves aligned in the center of the east end of the building that they knew it was. The graves mark the chancel area in the front of the church, where the altar would have been placed and where elite members of the community would have been buried. 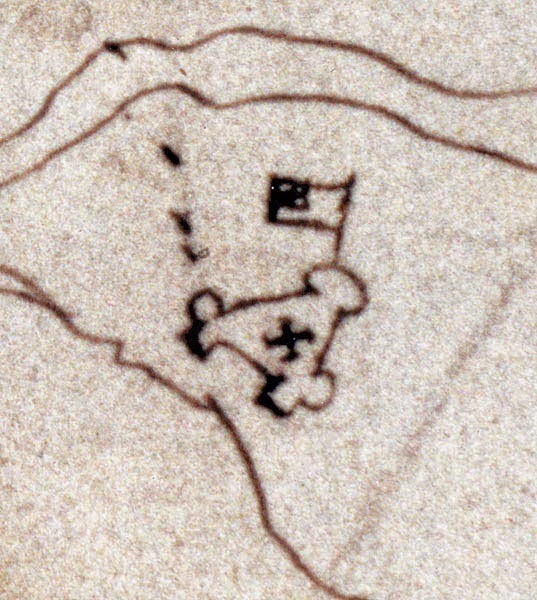 The building's footprint, measuring twenty-four by sixty feet, matched the dimensions as documented by Jamestown colonist William Strachey's 1610 account. Within the church building there were four burials, two of which may have been clergy. Their identities, based on artifacts they were buried with and other forensic evidence, are currently being researched and analyzed. where John Rolfe married Pocahontas. Finding the original walls and boundaries of Fort James was not an easy task. Going against the accepted theory that the land that Fort James was on was now in the river, Dr. Kelso began searching for the fort on the island. In the spring of 1607, the colonists, then under attack from the Virginia Indians, constructed a triangular fort enclosure in nineteen days. Archaeologists identified the original clay-filled trenches dug for setting the posts and darker soil stains from the original timber posts. The dimensions of the walls discovered matched perfectly to the 1610 measurements recorded by Secretary of the Colony William Strachey. Today, replica posts have been constructed over the original outline of the fort. However, half of the southern palisade wall along the river has been lost due to erosion. Along the southern palisade wall is a replica barracks building, which through archaeological research, is also constructed over top of the original post holes, which aided historians in determining the dimensions and placement of the building. The framing of it is made of modern materials to simulate what once stood there. The building was constructed using the "mud-and-stud" method, a common seventeenth century building method. Structures built using this method still exist in Lincolnshire, England. Excavations along the interior of the west palisade wall between 2003 and 2005 uncovered the cobblestone foundations of two large structures, both of which had brick chimney bases. One chimney base contained several pieces of limestone cobbles from Bermuda. The Bermuda limestone is significant because it placed the construction date after May 1610 when the first ships from Bermuda came to Jamestown. Ralph Hamor, an original settler of Jamestown, described two fort buildings constructed under the direction of Governor Thomas Gates as, "two fair rows of houses, all of framed timber, two stories, and an upper garret, or corn loft." Researches believe that the eastern end of the smaller row house or possibly the entire building, served as residences for Lieutenant Governor Sir Thomas Gates and other government officials. Beneath the foundations for Councillor's Row, twenty-nine burials, now marked by crosses were discovered. This graveyard likely holds the remains of the English colonists who died in 1607. John Smith stated that fifty colonists died between May and September 1607. Researchers believe that the buildings were built over the graves because of instructions given to the settlers before they left; to not let the Indians know of their vulnerabilities and reduced numbers due to death and disease. After 1620, Jamestown spread beyond the fort walls to the eastern side of the island, adjacent to the fort, where more substantial homes, at least one tavern, and numerous warehouses were constructed. Today, this area is known as "New Towne." Buildings in this area include Governor John Harvey's 1630s home, which doubled as the statehouse, Colonel Thomas Swan's 1670 tavern, rowhomes, and the ruins of the Georgian-style mid-eighteenth century Ambler House, which was the centerpiece of a large plantation estate. This building suffered two fires due to war and burned a final time in 1895. After the 1895 fire, it was abandoned. The foundations of many of the homes and other buildings were excavated in the 1930s and 1950s. Outlines of these original foundations were built over top of the original using modern bricks and are scattered throughout the "New Towne" site. This is just a sampling of the many discoveries and areas to explore at Historic Jamestowne, where the first successful English colony was established, firmly planting roots (after much hardship and struggle) for what would become the United States of America.